RUSS: "Just lookin' at the combine...mom, I am getting so excited for grain harvest. It is going to be so awesome! Are you excited?" RUSS: "Mom...you don't ride in the combine like me...you don't know about grain harvest like me". What a fun life for a little boy!!! That is cute! Hopefully he gets this excited when he's older and can help daddy more! When you say grain, I'm assuming wheat, but I could be wrong. Russ is what my son was like at that age. 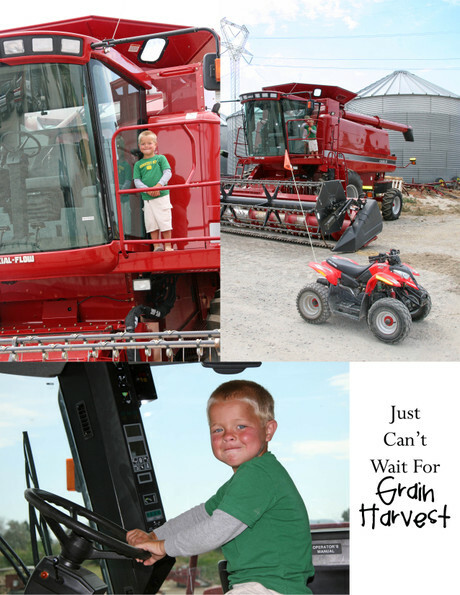 He LOVED combines, he loved the trucks, he loved everything about wheat harvest. He could spend hours upon end in the combines and the trucks. When he was in high school and the first couple of years of college, he went on wheat harvest with a crew from our town. He was in hog heaven the entire summer and fall - one year he was with the harvest crew from Arizona, through Texas (our state) all the way to Montana in the fall. At the age of 18 he was hauling a combine on an 18 wheeler through large cities on an interstate highway! His first true love. I told my husband this evening we should give up cuty life, pack up and all move to Idaho to become farmers. Your life looks so wonderful. Such a big boy already!! I can't believe he can actually fall asleep in that thing!! He's so cute! So totally a country boy!!! What grains do you grow? !